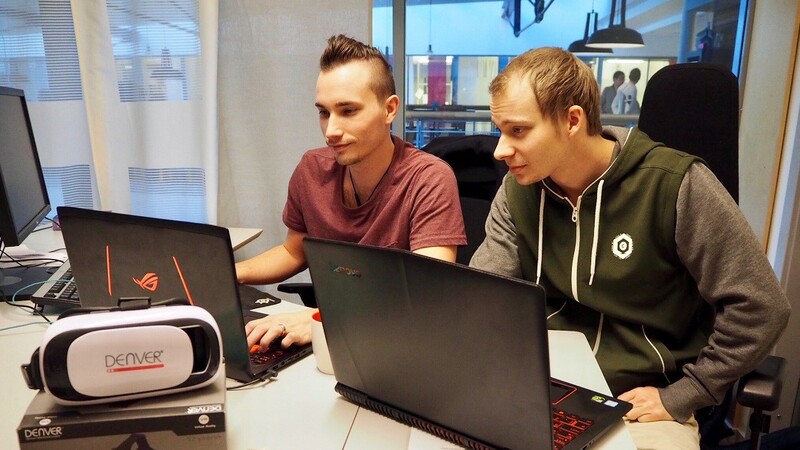 Every day for six weeks Johan Magnusson (to the left) and Daniel Fröjdendahl (to the right) have worked on the VR application that introduces a new way of consuming information. Photo: Sigma Technology. The idea of the project came from Johnny Fägersten, Operations Manager at Sigma Technology Solutions West. He suggested modifying an existing AR mobile app and transforming it into the virtual reality. The concept was to make product information more visual, presenting it in a more user-friendly way. The initial app was built on Android OpenGL, but we decided to change to Unity since it was a better Android VR platform. How did you transform the app? Did you add new functionality to the solution? Apart from VR, a new feature could be the way how the documentation is presented in the new solution. Basically, we improved everything that the application already had. Before you could look at four spots to trigger the data points. Then a new page would appear where you could read the information. The design of those pages still had a strong resemblance to a PDF. Now, we introduced the same system where we have hotspots that you use to trigger the information, but the spots actually represent the things and objects you would look for. For example, if you want to look at a tire of a car, then the information about a tire would pop up in a virtual space where you can read it, which gives you much richer user experience. The information becomes easier to understand and remember when it is visualized in this way. Then there are some new features allowing you twist the car, open the doors, and get into the car. The model of the car that we have now is much more detailed. The end-users in our example are customers who consider buying a car or have just made a purchase. The concept, though, has further application areas. First of all, the products are not limited to cars, it can be anything. Then the solution can be used from another perspective. For example, by a technical writer who develops product documentation. Instead of writing new chapters for new versions of the project, a technical writer could have pre-written data and add notes to the product later. Imagine that you have Microsoft HoloLens glasses. You can control documentation with your movements. As you write a text, you can move it with your hand gestures and place it on a product, for example, a car. So, everything gets more visual and VR improves the workflow immensely. The solution would be very useful for exhibitions and meetings where you can showcase a new product or even completely new concepts that are not even developed. The way how we communicate and convey visions and concepts gets transformed to a whole new level. One more area of use – education. Hard-defined concepts become more visual and interactive with our VR solution. Johan was responsible for the development, and Daniel took care of the testing. They made peer programming and testing, as well as planning and styling together. We had a great synergy – tester and developer worked together. It helped us to spot a lot of problems in the solution. Your VR project got featured in the Sigma Technology Christmas Calendar. Can you tell us a bit more about your Christmas edition of the app? The Christmas project was optimized for a computer, which allowed us to add a lot more visual effects and objects comparing to what we could do on a mobile. We added some Christmassy feel and surprising things to a usual app landscape. So, basically, the Christmas edition has almost all features of our current project and presents the whole concept of visualizing information, virtual reality, and the product information. See the movie on Facebook. Would you like to learn more about the project or suggest a project for an internship at Sigma Technology, Gothenburg? Contact Johnny Fägersten johnny.fagersten@sigmatechnology.se.